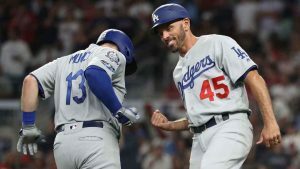 The Texas Rangers have hired Los Angeles Dodgers third-base coach Chris Woodward as their new manager, the team announced Saturday. Woodward received a three-year contract with a club option for 2022. He is to be introduced at a news conference Monday. A former utility infielder, Woodward played in parts of 12 major league seasons with the Toronto Blue Jays, New York Mets, Atlanta Braves, Seattle Mariners and Boston Red Sox. After retiring in 2012, he joined the Mariners’ organization and served as infield coach from 2014 to 2015 before signing on with the Dodgers. The Rangers are coming off a dismal 67-95 season that saw them finish at the bottom of the American League West. The hiring ends a process during which general manager Jon Daniels and the Rangers interviewed more than 10 candidates, including bench coach Don Wakamatsu after he served as interim manager the final 10 games of the season. Woodward was teammates with Adrian Beltre for a short period during the 2009 season with the Mariners. Beltre, who has 3,166 career hits, just completed his 21st big league season and hasn’t said whether he will return to play for the Rangers again next year.